FIROZE: Since it started, international aid from the West was for the purpose of bringing African economies into the global capitalist system. This system relies on Africa’s resources to grow. The relationship of giving aid has developed over hundreds of years and it is harmful to most Africans. And no-one has challenged how the West gives aid. The West has exploited the people and resources of Africa for at least 50 years. Africa has helped develop the West as much as the West has helped underdevelop Africa. Africa gets about $133.7 billion each year from official aid, grants, loans to private companies, gifts etc. (from a 2014 report). But at the same time, about $191.9 billion comes back to the West from Africa in the form of debt repayments, multinational company profits, illegal money, fishing or cutting trees and in other ways. But this may be more than $218 billion now. So Africa loses more than $85 billion every year. This means that West is not helping Africa, but Africa is helping the West. So let’s get the question right: Should Africa stop giving aid to the West? The answer to that is definitely yes. PABLO: I agree that after decolonization, it has often been easy to see foreign aid as just another part of global capitalism. The aid system started after the Second World War to help the two big powers: communism and Western anti-communism. But this politics of power cannot be the only reason for more and more aid, to countries with no special interest for the West. Other reasons are humanitarianism and internationalism, whether these are positive or not. Stopping foreign aid will not stop exploitation in the future. Africa would simply owe more money (from Firoze’s figures, from $85 billion it owes now to over $200 billion). If we stop Western aid, most money from other countries would only go to the most important people in African capitals. Now there are many groups that benefit from Western foreign aid. FIROZE: Pablo, you haven’t understood. Aid is not one way of getting money to Africa. Aid makes it possible to take money from Africa. In the world of today, we make nature something we can buy and sell, we privatize what should be public, we have free markets, and we allow big companies to destroy the environment. Aid uses public money to help these neoliberal ideas, so most people in the world get poorer and a few important people get richer. Many of the smaller groups that receive aid money often deliver services. Society accepts them and they are dependent on foreign aid. But they try to ‘save’ people. And so they need to keep the people who need ‘saving’. The history of this industry is ‘white saviours’ going to save the black Africans. This is what ‘aid’ is now. But it doesn’t have to be that way. PABLO: People have been exploiting Africa for at least 500 years, but the aid system is only 60 years old. So aid cannot be the cause of exploitation. Here is an example. In Ghana, I see foreign companies looking for offshore oil and important people in Ghana are happy to give contracts that are not very transparent. No aid there. But a local group of Ghanaians are trying to change the policy about natural resources and make contracts more transparent – with the support of foreign aid. Also, in Rwanda, the government is very suspicious of foreign help, but they ask international partners for money for economic changes in the country – changes that could make them free of depending on aid. There are no white saviours or African victims in these examples. Just civil-society challengers trying to keep elites accountable; or leaders seeking funds to implement their own developmental vision. That right there is the kind of progressive action that aid can support around Africa. FIROZE: Pablo, you should remember that oil, gas and coal are multi-billion-dollar businesses, but every year these companies get billions in help avoiding tax, financial help from their home governments: big donor countries such as the UK, US and Canada. Millions of dollars of aid go directly to projects to make businesses more responsible, such as the $4.5-million grant by the Canadian government to Lundin for Africa, part of the big Lundin Group of mining companies, for mining in Ghana, Mali and Senegal. And OECD records show that Rwanda – a government that does not allow people to disagree with it – received more than $1 billion dollars in aid in 2016. The ‘progressive action’ you talk about needs us to help people fighting for freedom. For example, Abahlali baseMjondolo, the South African movement for people who live in shacks, doesn’t need or want ‘aid’, but needs protection for its members against attacks from the government. There are organizations around the world that work hard to make their governments and businesses help, and help people in many countries. This type of help gives hope for the basic economic, social and political changes we need. PABLO: Firoze, I think this discussion is like the basic discussion between maximalists and incrementalists. Maximalists usually believe – like you are arguing well – that we need to change everything about what is happening today because it is so bad and corrupt. Incrementalists say that small improvements now are more practical than a revolution in the future, but we have to live in an imperfect world. And of course, this is an imperfect world. Some of the most successful reductions in poverty have been by governments that are not democratic; and more open societies often have greedy businesses or support illegal acts. That is the Africa of today. Similar to Europe, the US and Asia. Foreign aid is not perfect, but it helps in the grey areas of development. It works slowly: testing, searching, making many mistakes, but also helping people work together sometimes, and planting the seeds of change. This division between maximalists and incrementalists is not good. While the internationalists are arguing, many types of nationalists and populists will take control because people are afraid of the other one. I hope, if foreign aid is good or not, you can work together with incrementalists like me and see us as friends, not opposites as we work for progress in Africa. 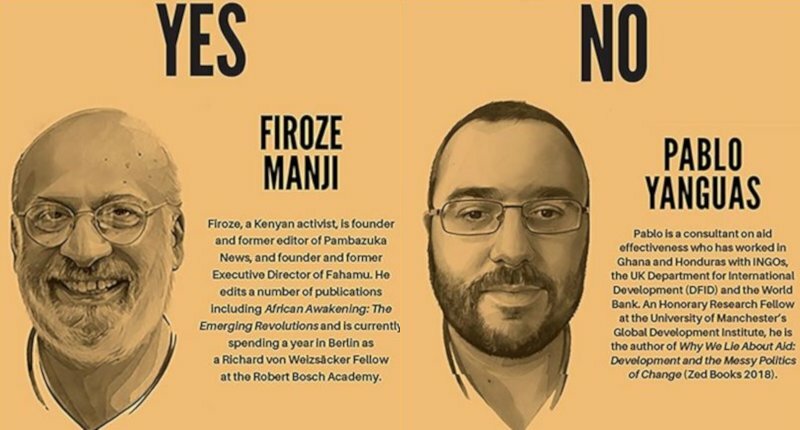 Firoze Manji, a Kenyan activist, started and edited Pambazuka News, and started and directed Fahamu. Now in Berlin at the Robert Bosch Academy. PabloYanguas is a consultant on aid effectiveness who has worked in Ghana and Honduras with INGOs, the UK Department for International Development (DFID) and the World Bank. Now at the University of Manchester’s Global Development Institute.